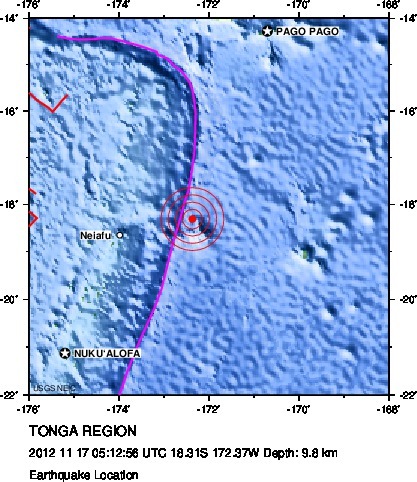 Shallow earthquake with recorded Magnitude 6.1 hit Tonga region on November 17, 2012 at 05:12 UTC according to USGS. Epicenter was located 174 km (108 miles) ENE of Neiafu, Tonga and 473 km (293 miles) SSW of Tafuna, American Samoa at coordinates 18.311°S, 172.374°W. Recorded depth by USGS was only 9.8 km (6.1 miles). EMSC recorded magnitude 5.9. No people are living within 100 km.